Cadenza Violins is your local expert in stringed musical instruments. Learn more about our services and violins. String musical instrument rentals, repairs, and restorations. Cadenza Violins can help provide you with great sounding instruments. We are your local string instrument provider. Our staff consists of skilled craftsman and music experts. 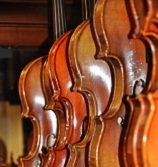 We offer a complete inventory of string instruments available for anyone. We do rentals, repairs, and restorations. Interested in renting from us? Start here to learn more or call us at (469) 241-1152 for a consultation. Want to learn more about violins? Sign up and we'll send you tips and advice from our blog written by industry experts.